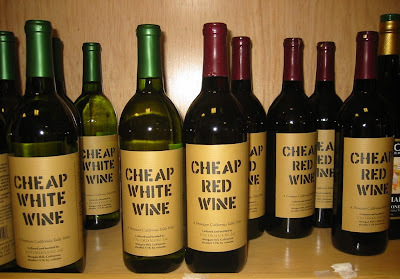 For those of you about to hit Europe for a chalet holiday there is one thing you will always find in abundance - free and always surprisingly heinous wine. For years this evil beverage has served no purpose other than dyeing clothes and starting fights. However if you embrace this game's simple rules you will find yourself unlocking the door to a better chalet experience and a better life. Like most people, I always thought jousting was invented by the Gladiators but apparently it has a history at least as long as snowboarding. Swatting up on the history though, it seems that when our ancestors weren’t beating the life out of some peasants in a remote part of Christendom, or France, we used our spare time to master the art of jousting. I'm no horse whisperer, but it's clearly embarrassment that has driven this horse to go to the trouble of fashioning a mask and cloak to hide its identity. That video is surprisingly dull all things considered. I guess this is why the 60s didn’t last beyond that decade. No idea what is going on but it certainly has the pageantry and enthusiasm that the Vesper lot really missed the boat on. And probably the most weak of the degenerate jousting specialities is finger jousting. 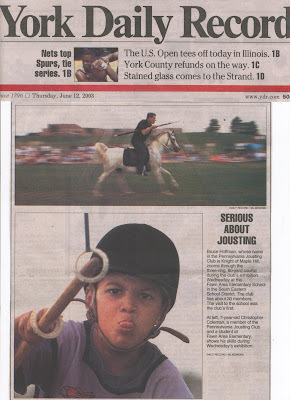 Some kid from the US called Julien Gluck the self-styled 'Lord of the Joust' has invented this pitiful sport. I guess it's because he is to young to wine joust like a real man, given that he lives in the US and is under the age of 37. He's a better idea Julie, I'd pay to watch this. OK so essentially international wine jousting doesn’t bear much in common with most other forms of jousting, but now you have learned yourselves some history, learn yourself some future. So how do you play International Wine Jousting? Rule 1. Fill someone else's glass up to the brim. Essentially style is the key to this game and not how much you drink. All other rules are up for discussion and open debate/conflict is encouraged. Yup, the essence of this game is talking a good game and looking for some technique. I'm a big proponent of the no-look pour but others have mastered techniques such as the double-pour, the back-hander, the steal and the legendary table-sweep. You might be asking what exactly are these skills? Well International Wine Jousting, just like snowboarding has a silly name for every trick. As for the details I haven't got the time to write step by step trickology guide here and you'll just have to work them out for yourselves, because like I said, this is a game for grown-ups. What is this? Surely this shouldn't be allowed. I'm now an alcoholic simply because I was taken in by the marketing of alcopops when I was a kid. 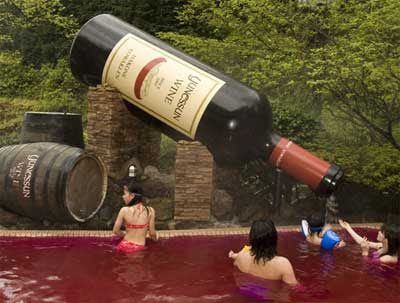 If I'd been brought up swimming in pools of wine my kidneys would have exploded by now. I'm sending this to the Daily Mail right now! Have fun out there and stay safe you crazy snowjousters.